Time to put on our party hats and celebrate! 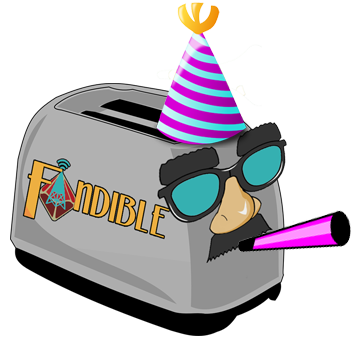 Fandible is EIGHT years old! We started out just a band of rogues and scoundrels, each desperately looking for a group of people to roleplay with. Dan, Jesus, Angela, and I met at a meet up (seriously, try Meetup.com for finding a roleplaying group!). While the group we met at the Deli on 65th street were a touch too… dramatic for our taste, it put us in touch with each other. Jesus invited Angela, Dan, and I over for a game – and the rest is history. Oh, right. We picked up David like a year later. We picked up a few players since then who have come and gone. Our early days brought us Jose and James, and the newer days dropped off Tex as our intern. Fandible has even occasionally had pipe dreams of getting a sixth permanent member of Fandible – but few are crazy enough to give up every Saturday to scream into a microphone. Regardless, the five of us have worked hard for one reason alone: You. Yes, you. You with the weird hair, bald spots, messy curls, frizzy hair, and etc. Without fans constantly stroking our incredibly thin and delicate egos, we would have given up years ago and tried something new – like grad school. You have been the true lifeblood of Fandible, and we absolutely are thankful for that. Patreon members first made it possible for us to expand Fandible (With the Longshot and SoloShot). And Fandible Patrons have made it possible for us to continue as a podcast after the birth of Lucas. Without those monthly funds, Angela and I wouldn’t have been able to afford the 200 dollar babysitting bill at the end of the month! Your support has also made it possible for us to get nominated for an ENNIE this year! Yes, we didn’t win, but we’re fairly sure we are the FIRST Actual Play Podcast to get nominated. Which is sort of a big deal! We are so excited to represent Actual Plays this year at the Ennies, and we hope to see more Actual Plays get nominated in the future… and we also hope to win an Ennie at some point too. Cause we’re greedy like that. So what have we been doing the past eight years? Well, let’s throw some stats your way. We’ve gone from one Friday show to three shows a week (SoloShot is coming back in October, I swear! ), and we’ve been pumping out blog posts pretty consistently! We have t-shirts ready to be ordered and a Discord Channel that our Patreon members seem to enjoy. But still… there is so much more we can be doing. Starting in December, we’re going to open up the Fandible Notebook to our Patrons. The Fandible Notebook is a release every month of content from Fandible. Be it notes on settings from our games to new actual games themselves. We have one-page RPGs being worked on and write up from past campaigns that you can use to torture your players! Every month, a new piece of the Notebook will be revealed. At the end of the year, the notebook will be put into one giant book, and we’ll sell it to the rest of the population. We are so incredibly proud of ourselves for keeping this podcast going for so long. And we’re so incredibly grateful for the community that has formed around it. Thank you all for listening to us, commenting with us, and accepting us regardless of the many, many flaws we clearly have. I’m happy to be here to see Fandible off to 3rd grade with all the other fans. The entertainment you’ve brought to me personally has been something I cherish and try to share with my friends as much as I can. Here’s to many more years ahead! Ok, I gotta get real here. I discovered Fandible three years ago while I was looking for things to keep my brain occupied at my part time job as a dishwasher. In the last three years, many other podcasts both actual play and not have come and gone from my phone, but Fandible has consistently remained. Between traveling with the crew of the Shadow Labyrinth, cowering in fear/awe over Moira Clayton, fighting off the myriad horrors of the Billyverse, to even just guessing which new accent Billy or David will be using for this outing, you guys have remained a consistent source of amazing laughs and deep storytelling and worldbuilding, and have served as regular inspiration for me to up my own writing game. I can only hope that the day will come when grad school stops kicking me in the teeth and I will have the time to hunt down my own gaming crew. If we can have even half as much fun as I’ve had tuning in to Fandible, I’ll consider it a resounding success. Congratulations on eight amazing years, Fandible Crew, and thanks for continuing to give me reasons to laugh and smile no matter how dark and unfriendly the world can seem. You guys sometimes feel like a crazy extended family to me, and I wish you nothing but the best for all the years to come. Thank you both for your kind words! Seriously, it’s comments like this that make us feel all inspired and such! We really are happy that we’ve brought laughter to people’s lives, and we hope to continue it all in the coming years. Congratulations and heres to eight-y more!! Cheers ya’ll. I remember jumping on this crazy train to the blissful sounds of Xenos Night Out, and y’all just keep kicking goals. Thanks for all the good times and the hard work you put in to create them. Can’t really say much more in truth. You’re a pretty serious inspiration. Congratulations! I came to fandible back near the end of 2012/start of 2013 after having moved from Toledo, Ohio down here to Alabama … I live out in the middle of nowhere almost . Nobody around here really shares my interests. It’s kinda lonely living eith her immediate family, and, just fast food work and secluded country life that others but not myself would enjoy , so my wife (then fiancée ) got me a Tablet and I found your podcast… so cheers to you guys for probably keeping me from going even crazier than I have! Your podcastalso gave me the guts to at least try and get a few sessions started with the 1 or 2 others I found interested in such things before they moved away. I have other gaming podcasts but yours is the only one I can say with certainty that I listen to regularly, and with anticipation. May you guys continue to be able to enjoy your sessions with each other , may your endeavors continue to see prosperity and growth, and who knows maybe you’ll find a sixth , seventh or even more-eth member out there.